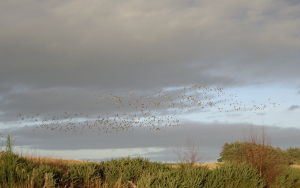 Driving into Dornoch saw this flock in the distance flying round and round farmland. After about five minutes they flew off. They were noisy calling all the time. These photographs are the best we could get with our digital, is it possible to identify them from these photos ?